The post office is a “have-to” place. You can see it on the expressionless faces of the customers shuffling through line. If an accidental conversation begins, everyone can hear it…word for word. The only other exchanges are between the customers and workers who are only there…because they have to be. Outside of sterile words, there is an uncomfortable silence, eyes avoiding connection, a general separation, and an overwhelming sense that time is simply lost here. I don’t believe in waiting, and I have tried to adopt the attitude that nothing I do wastes time…as long as I’m conscientious about it. 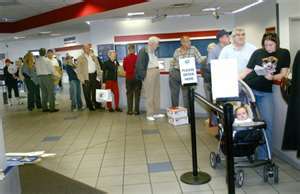 So, during a recent visit to the post office, I stood in line, like everyone else. The difference for me, however, was how entertained I became by the cast of characters sprinkled throughout the room. They included a pair of Bitter Bettys, Bad-Bottom-of-the-Box Bob, Irate Irene, Mad Max and Disgruntled Postpeople. The multiple storylines happened simultaneously, and it took some effort to truly decipher the subplots. When I walked in the door, Irate Irene was standing on one side of the counter and Disgruntled Postlady was standing on the other. “…it was Express, and it didn’t get there in time,” Irate Irene loudly explained. I politely moved my gaze to the unwelcoming white wall, so as not to seem too interested in their battle. “Sir, your box is falling apart on the bottom there,” one woman of the Bitter Betty pair pointed out to a man I had not yet noticed. “Oh, it’s fine,” Bad-Bottom-of-the-Box Bob frustratingly turned his body away from the comment and leaned in closer to the counter he was approaching. Sarcasm enveloped the Bitter Bettys as they complained about the strength of their legs to withstand the five-minute wait. They emboldened each other as the complaints gained momentum and their attitudes became evident to the twenty-or-so people waiting behind them. They were good at growing bitterness. Bad-Bottom-of-the-Box Bob struggled with Postman when he was told the bottom of his box was not ready to ship. He was sent to retape it. The tape he ripped, to secure the gap, was torn with such an intensity it clearly indicated his disdain for the entire process. As the line inched forward, and one of the three windows became vacant, Bob and Irene continued to loudly discuss the inadequacies of the Federal postal system. The Bitter Bettys echoed the sentiment for the line-standers, and then Mad Max quietly made his way to the third open window. His hushed and seething anger eventually became loud enough I could hear him. “Mwah, mwah,” was all I could make out from the quieter Postman. Disgruntled postman disappeared into the back to both escape Mad Max and retrieve Stranded Shelley’s mail. By this time, Irate Irene was visiting with both Disgruntled Postlady and the manager. I was nearing the front of the line, and hoping, beyond all hope, that I would be the next customer to take up the space where Irate Irene was standing. I got my wish. Disgruntled Postlady seemed startled at my genuine joy. You see… the post office is a “get to” place for me. I get to follow the stories of the characters I see. I get to be a warm smile for patient children and frazzled mail people in hopes to interrupt the dreary energy that permeates the room. I get to open the car door for the mail-loaded man who struggles on his crutches. I get to mail out an autographed book or two a day, and there is no reason to see the post office as anything other than a “get to” place. The mail room is a “have to” place for most everyone. The thing is…it really doesn’t have to be. Thank you for stopping by and the congrat’s. I agree there does need to be more outlet’s. It’s such a blessing to be able to pay tribute to my dad in print. I have another story coming out in July in the Hurray God series about my mom. Oh my. I seem to get the same people when I’m waiting in line at the post office!! Cute post, thanks for the laugh! YAY Meagan!! You remind us all how simple it really is to see the world as WE want it to be, as WE choose it to be!! And even in…the post office!! Great message – I’m so trying to teach it to the kids. Choose to increase your own quality of life :).